Nothing better than Wild Caught Sourdough! With a few tweaks gleaned from Michael Pollan’s book “Cooked” I am now routinely able to produce truly wonderful bread from my wild caught sourdough starter Audrey. The two most important changes are (1) testing the starter for readiness by dropping a spoonful in a glass of water and if it floats it’s ready, and (2) doing the bulk fermentation overnight in the fridge. Still one achievement left to go (we are never completely satisfied) and that is a good “ear” as they call it. I need to get a “lame” lol! But this bread is wonderful. Easy to slice, chewy inside with good “crumb” with bubbles (not too big or too many) and crispy bottom crust. And stays fresh (though it doesn’t stick around very long … it is that good)! Great for sandwiches! 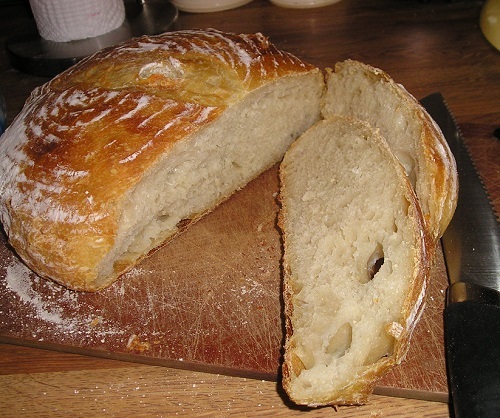 Fermented Wild Caught Sourdough is so easy to make on your own. My “Audrey” (we sourdough fanatics name our starters) was caught by soaking some golden raisins in water for a week then using the drained off water mixed with flour until the wild yeasts and lacto-bacteria (they are everywhere) colonized. Once you have that wonderful starter, it is a “pet” in the sense that you are going to be responsible for the care and feeding of it, but that’s not hard, and it yields such wonderful results. Most important of all, the health benefits of fermented bread (and not all sourdough you buy is truly fermented) are just so great! If you think you cannot digest gluten, the slow fermentation of sourdough may just solve that problem. There are true celeriacs, but there are many more who are actually just responding to the lack of fermentation in commercial bread. As Michael Pollan so eloquently catalogues, fermentation is a form of digestion, so sourdough actually pre-digests the gluten! And then there are the pro-biotic advantages of fermentation. We are vessels for a whole community of millions and millions of microbes known as the “microbiome” the genes of which actually outnumber our own cells by a factor of 100 to 1! Maintaining a healthy microbiome keeps the bad microbes in check, protects us from toxins and influences our digestion, immune function, even our personality! Much research is ongoing. 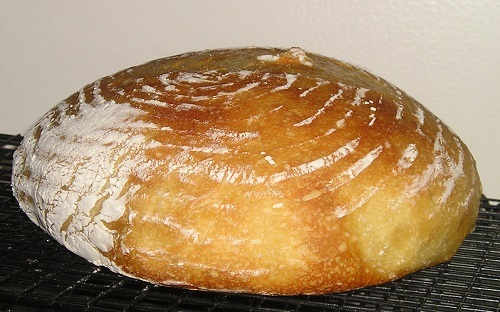 Baking a sourdough loaf takes so little hands-on time – no kneading, just a few stretch & pulls. It does take time to re-activate your starter, and ferment your dough, but that is not time that involves you directly, other than as an observer. I hope you will give it a try! This entry was posted in Cooking & Recipes, Health and tagged Bread baking, microbiome, Sourdough by Cherry Gal. Bookmark the permalink. Thanks for that great article! Our food supply has been so greatly compromised it’s a wonder we’re all still here. Unfortunately here but not in good health. Your articles are helping to show the way back to better health. Read yesterday that a new antibiotic has been found in the NOSE! A good example of what goes on in our bodies if we give them a chance! Now they will patent and produce this as the next generation of antibiotics, which of course will be over-prescribed leading to yet another mutation of resistant bacteria. I wonder why more isn’t done to simply educate us on how to maintain a healthy microbiome? Oh yeah, there’s no money in it. Silly me.